Michele Weiner Davis gives a presentation at the 2010 Smart Marriages Conference about a therapist’s techniques in divorce prevention. Although strategy can play a major role in preventing divorce, Michele highlights that a marriage therapist’s biases, beliefs, perceptions, etc., play a greater role in a marriage’s outcome than anything else. I do my best to regularly contribute bits and pieces of marriage advice with my Divorce Busting social media communities. It’s always interesting for me to read people’s examples of how they adopt the Divorce Busting approach- you guys really are a creative bunch! Recently, however, there was a bit of confusion with one of the posts on the Divorce Busting Facebook Page. I write this post in order to clarify my thoughts. But in the end, if your marriage is truly teetering on the brink of divorce and you have been trying everything you can think of, sometimes no message is the most powerful message of all! But before you draw that conclusion, read this post! When you are trying to get through to your partner, there are many ways to do it. You can have a face-to-face discussion, write a heartfelt letter, e-mail or text message, talk about things over the phone, or send a greeting card. Many couples (including Jim and me) admit to having some of their most productive conversations over the phone. I often encourage couples to call each other, even if they’re in the same house! The point is, just because you might not be able to get through to your partner during a face-to-face conversation, doesn’t mean you should give up. 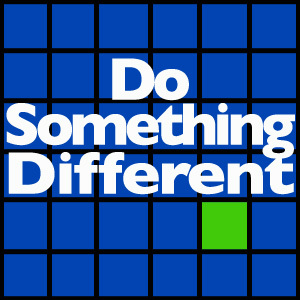 Simply try a different medium. I know a woman who had been begging her husband for months to be more forthcoming about his out-of-town trips or his late nights at work so that she could make her own plans. Despite what seemed like several thousand reminders, he never did what she asked. This enraged her and they fought constantly. One day, instead of doing the same old thing, she left a calendar and a Magic Marker on the kitchen counter along with a note suggesting that her husband mark his schedule for the following week. When she came downstairs, she discovered her calendar marked with his plans for the next three months. Another woman I know unintentionally hurt her husband’s feelings. She tried apologizing, but he wasn’t quite ready to accept. She gave him a day or two to pout, and still, he was holding his grudge. Again, she tried talking to him about the situation, but wasn’t receptive. Then she became creative. Right before his morning shower, she got out her lipstick and wrote, “I love you and I am very sorry” on the shower wall. Then, after putting the lipstick on her lips she kissed the wall, leaving “smacks” all over the shower. And then she waited quietly for him to begin his morning routine. Her husband shaved and stepped into their shower. He turned on the water and simultaneously started to laugh. Though words failed to break the ice, lipstick worked well. Here’s another example…Stu was very concerned about Resa’s drinking. For years, he talked of his concerns about her health and about the example she was setting for their two children. Stu’s mother was an alcoholic and he was extremely worried that Resa was going down the same path. Every time he discussed his fears with her, they ended up arguing and her behavior never changed. Out of desperation, he decided to write her a heartfelt letter, telling her how much he loved her and how scared he was about losing her. He left the letter on her dresser right before he went on a business trip. When he returned, he feared that she would be extremely angry at him, but much to his surprise, she greeted him with tears in her eyes and, for the first time in their marriage, admitted that she had a drinking problem. She also said that she was willing to talk to an addictions counselor to help her quit drinking. Resa told Stu that the letter gave her a chance to think about what he was saying without feeling that she needed to defend herself or react in any way. Although the feelings Stu expressed in the letter were very similar to discussion they had had in the past, she felt profoundly affected by seeing his words in black and white. I know what you’re thinking, “Of course I have to complain, my spouse never listens.” If that sounds familiar, you may have been asking to have your needs met in the wrong way. In fact, lots of times people think that they are requesting a change from their partners when they are doing nothing more than complaining. Complaints turn people off and build resistance. They don’t spark a spirit of cooperation. I learned this firsthand in my own marriage. 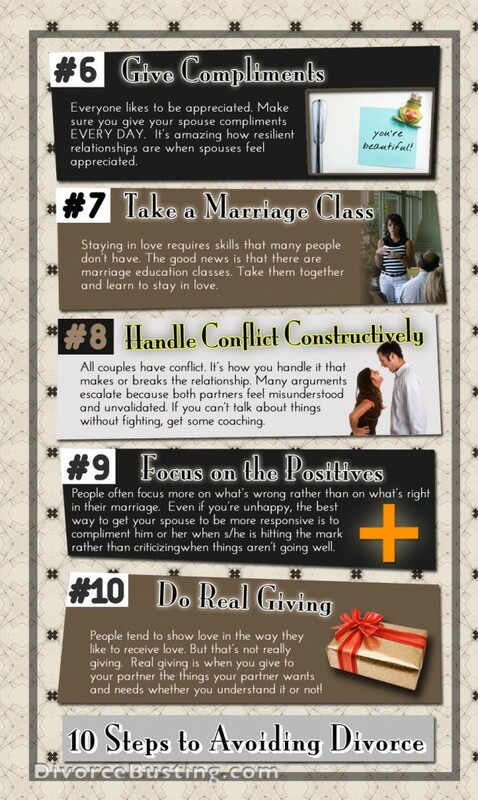 If you practice these 10 steps with regularity, your marriage will become stronger than ever. Bookmark these steps, post them on the fridge, write them on your hand, get a tattoo! 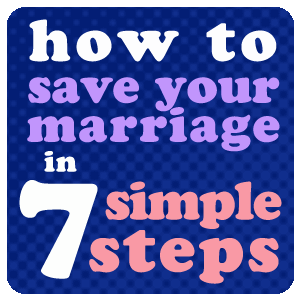 Just do what you can to familiarize yourself and your marriage will reap the benefits. Prevent your divorce; don’t fall victim to the walk-away wife syndrome. The Walkaway wife makes plans to leave her marriage well in advance of actually filing for divorce. Michele Weiner-Davis explains this process, including the wife’s preparation, timing, emotions, etc. Most importantly, she offers methods for how you can prevent your wife from walking away from you. Men need to know that it’s not too late to prevent their divorce, but that it’s easier to save your marriage if you stop the problem early on. Husbands, either way, pass this video onto your wife so they can avoid making the mistake of a lifetime. 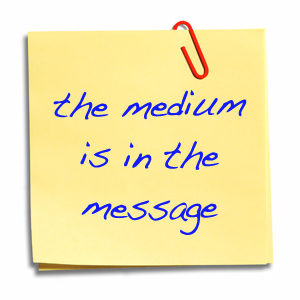 Clue #5: Note what’s different about the times that something constructive comes from “the problem”. Have you ever thought to yourself, “Our relationship would be easy if it weren’t for you?” If so, you will definitely need to read this two-part blog. It will help you enormously. Perhaps you have noticed that blaming your partner for things that go wrong doesn’t work all that well. I have rarely met a person who, when his or her partner points the finger of blame, replies, “Well, thank you for sharing that, dear. I will have to work on it. Does this mean that when things go badly, you just have to accept the status quo, grin and bear it? Absolutely not. There are many things you can do to change things, make things better and get your relationship on higher ground. 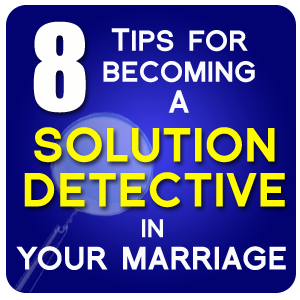 You have to become a solution detective. 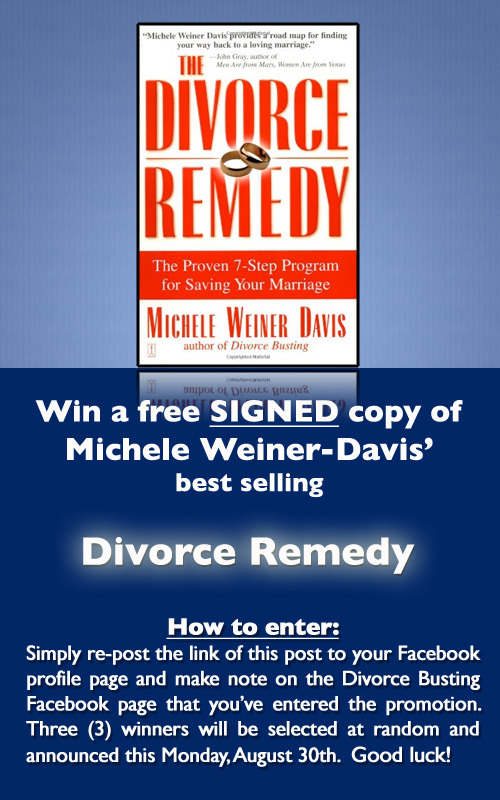 Win a Free Signed Copy of The Divorce Remedy by Michele Weiner Davis. Simply re-post this link of this post to your Facebook profile page and make note on the Divorce Busting Facebook page that you’ve entered the promotion. Three (3) winners will be selected at random and announced this Monday, August 30th. Good luck!